I have been to Latvia several times, always on my way to or from Russia. 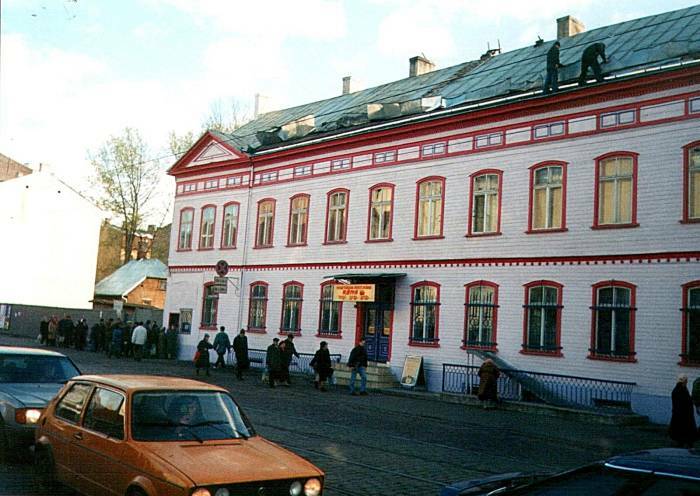 I was going to Russia to work on a project in Sankt-Peterburg doing repair work in a hospital. Estonia Cankt-Peterburg Lithuania I would fly to Helsinki, Finland, take one of the frequent ferries across the Gulf of Finland to Tallinn, Estonia, and then continue a few nights later by overnight train to Sankt-Peterburg. 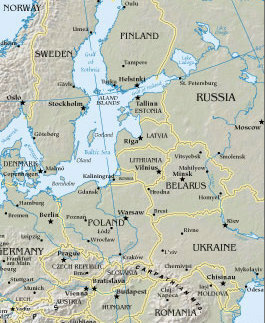 Then, on my roundabout way back, I would travel around the Baltics for a few days and visit Estonia, Latvia, and Lithuania. Those three countries are very interesting, and easy to get around by bus or train. Portion of a U.S. government map of eastern Europe. US Government map of Latvia. We're coming from the train station early in the morning after arrival from Tallinn or Sankt-Peterburg. This is looking from the big square where the train station is located, up Marijas Iela toward where it turns into Aleksander Caka Iela. 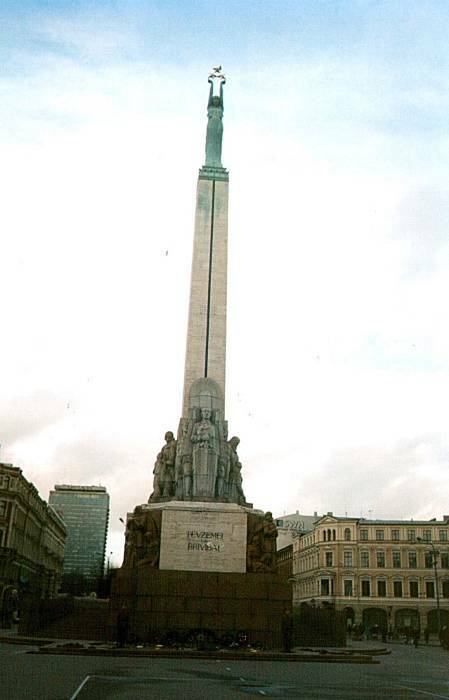 Below is a major monument in central Riga. With the end of Soviet rule, this monument has become a symbol of Latvian national pride. Well, it always was, but now Latvians can openly refer to it as such without risking a few years in the gulag. Below are two views from a tall cathedral steeple in the Old Town. The Daugava river has been a trade route since antiquity, and it was part of the Vikings' route to Byzantium along the Dvina and Dnieper. It developed as one of their trade centers during the early Middle Ages. Riga was built at a natural harbor some 15 kilometers up the river from its mouth into the Baltic. This settlement, known as Duna Urbs, was recorded as early as the 2nd Century. At that point it was settled by the Livs, an ancient Finnic tribe. In the 12th century the Chronicle of Henry of Livonia referred to Riga as a portus antiquus or ancient port, a trade center with warehouses storing mostly corn, flax and hides. 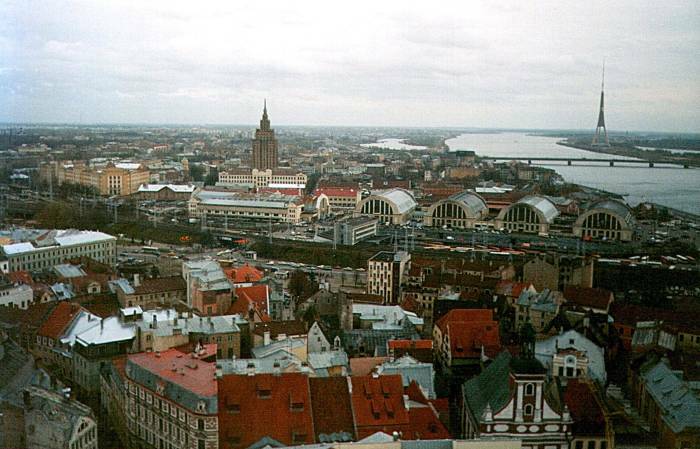 German traders began visiting Riga and established a nearby outpost in 1158. 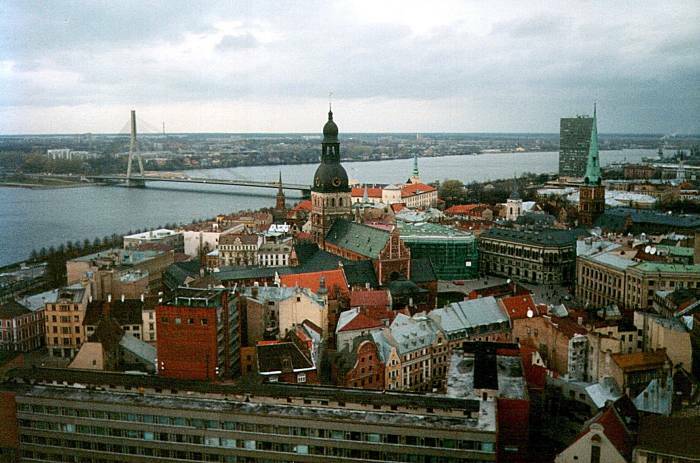 Riga became a member of the Hanseatic Leaguq in 1282, providing the city with economic and political stability. The Soviet Union occupied Latvia in June 1940, but within a year Nazi Germany came in, occupying the country 1941-1944. The Germans forced the city's large Jewish community into the Riga Ghetto on October 25th, 1941. They built a concentration camp at Mežaparks, which the Germans called Kaiserwald. Riga's history has produced an interesting mix of architecture. First, there's the Old Town itself. Then there is the Stalinist Grotesque. See the building above the horizon, to the left of center, in the lower of the two pictures taken from the tall steeple. Related to that is the Soviet Utilitarian. See the half-cylindrical concrete halls now serving as markets, in the lower of those two images. Finally, there is the Old Futuristic, looking modern today although built under Soviet rule. See the asymmetric suspension bridge and the large radio tower. Here is a better look at that Stalinist building up close. 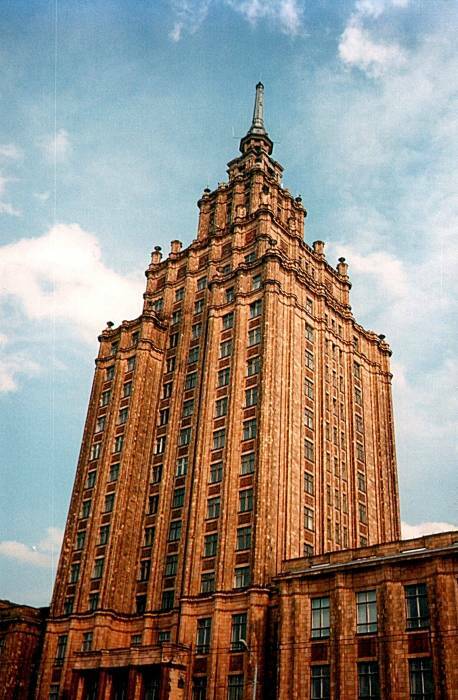 It is of the same general design as a series of buildings in Moscow, just not nearly as immense. Lots and lots of zithers! At least learn these words! There are trains between Vilnius, Lithuania, and Tallin, Estonia, stopping in Riga. From Riga there are buses and trains to other Latvian destinations. There has been train service between Sankt-Peterburg and Riga, but I don't know if it's still running. A nice day trip out of Riga is to head up to Sigulda. Local trains run every hour or so for about 1 Euro. A pleasant little town next to a nice national park. There weren't any hostels when I was going to Russia for the hospital project. There weren't many foreign tourists in Latvia then! 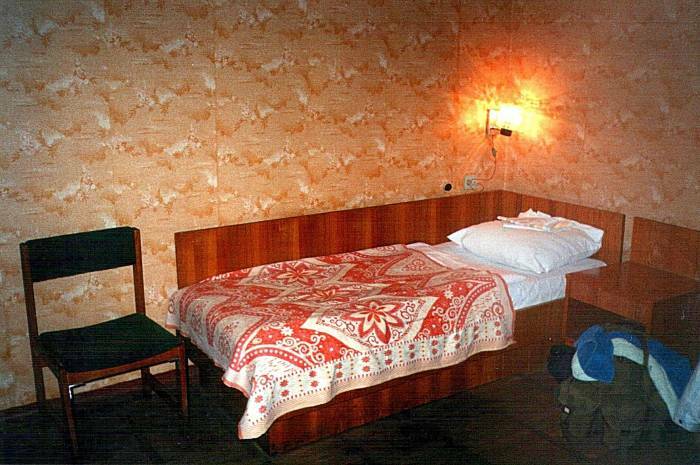 At the time, the best deal was an unrenovated (meaning "Soviet") room in the Hotel Viktorija. Unrenovated, but the rooms were nice as you can see here. The showers down the hall were pretty dire, but the museum quality of the dysfunctional TV set in the room may made up for that. That is, if you were a fan of archaic Soviet electronics. Leave the train station, head to your right on Marijas Iela, past a 24-hour exchange office. Marijas Iela turns into Aleksander Caka Iela after a few blocks. It's about eight blocks, about one kilometer, to the Viktorija. Travel in the former Soviet Union meant encounters with mystery meat referred to vaguely as kutlet. What is kutlet? Probably some sort of animal product. Or primarily animal product. Or at least containing animal product. And what does "product" mean? That's part of the exciting mystery of the kutlet! 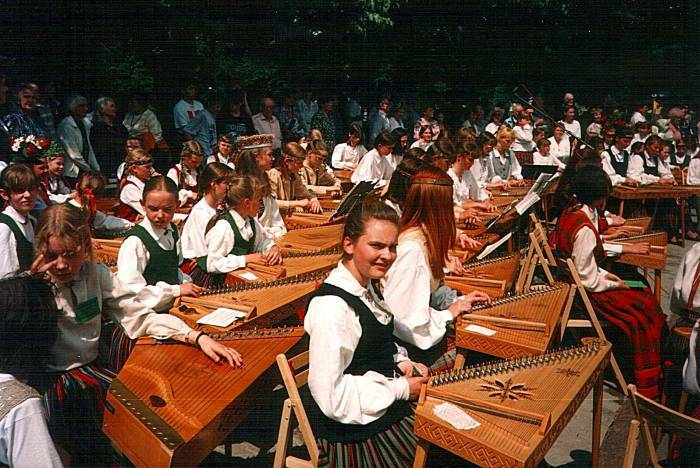 The prevalence of kutlet was one of the very few reminders that the Baltic countries used to be part of the USSR. 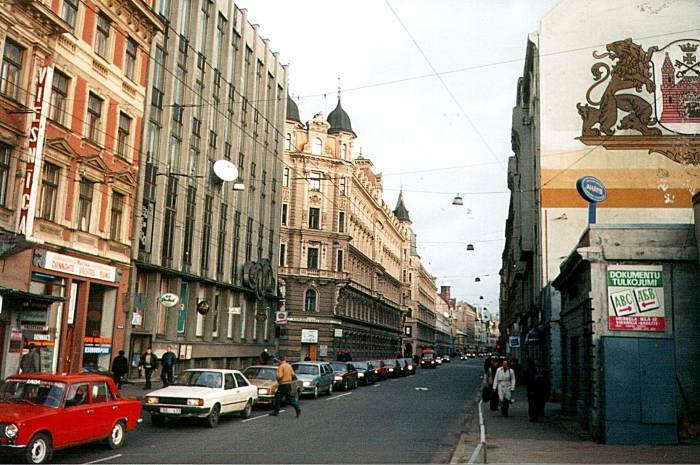 The Hare Krishna Cafe in Riga was a rare relief from the kutlet. A vegetarian buffet, with soothing plinky, plinky music and chanting. There was also a Hare Krishna place in Tallinn, Estonia, although the local food situation wasn't as dire there.